I'm not an avid baker by any means, in fact over the last few months I'm realizing that in fact I'm a fairly poor baker, and much better at cooking! However I do still enjoy to bake when the mood takes me, and I have been known to quickly whip something tasty up if we're lacking sweet treats in the house. Sometimes however, I don't have the time to spend hours baking, so when I came across this competition from Whittard to show your 'cake in a mug' skills, I thought it was a win-win situation - a competition entry and cake for me in one! I delved into my cupboard and chose the biggest mug I could find and got to work! I used a recipe from my ever growing 'sweet tooth' Pinterest board and adapted it slightly to suit me and my chocolatey needs! And a microwave to cook it in! Combine the flour, sugar and egg together. Add cocoa, followed by oil and milk. Thoroughly mix. 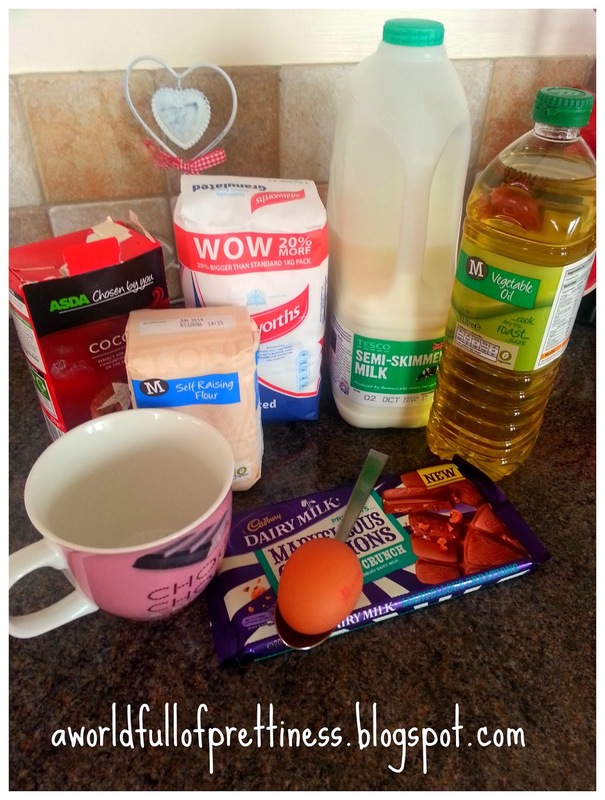 Add the chopped up chocolate (you can add as much or as little as you like). Mix well. Pop it in the microwave for 3 minutes... watch it rise, wait for it to *ping* and there you go - a 5 minute sponge cake. Scrummy! 'Decorate' it as you wish - I popped some whipped cream on top (which very quickly disappeared and melted from the heat!) but was still delicious! 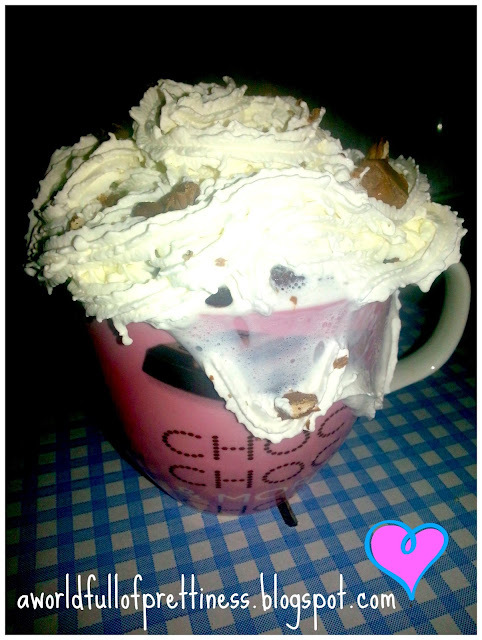 I also popped some left over chocolate chunks on top of the cream.. can't have any going to waste now! I really was impressed with this... it tasted very similar to the Cadbury sponges that you can buy. The cake was really moist, and the chocolate chunks really did help, giving a gooey melted mess inside, and surprisingly it wasn't sickly. The cake was that big I had to end up sharing it (which is something very rare with me and chocolate!) so next time I'm going to choose another mug! This is something I'll definite revisit in the future for a quick fix when I'm craving something sweet! 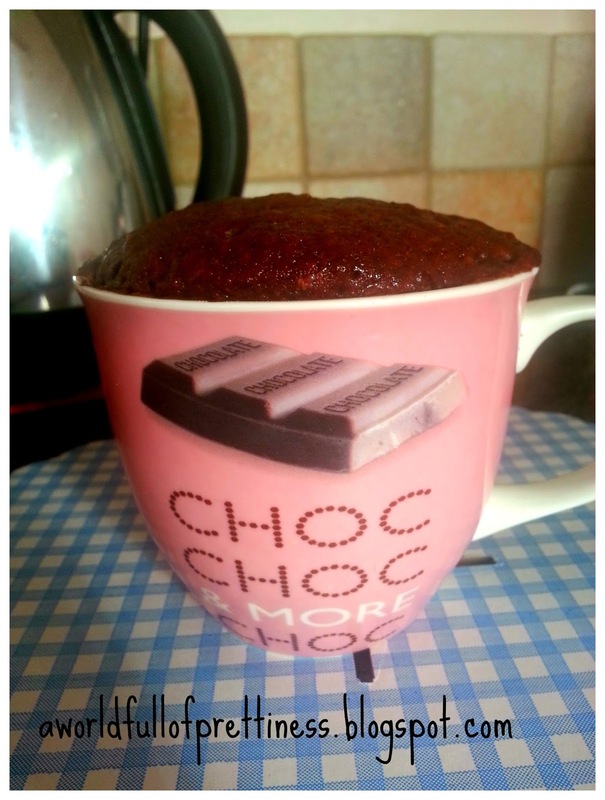 Have you ever made a cake in a mug before? This looks soooo goooood, too bad I stopped eating chocolate!